Victoria Hagan’s Nantucket house has two of them that break up all the upholstery in her living room. Another one in a more modern setting. I just love the texture it adds! Chairs like this can add a little warmth to otherwise sleek spaces. 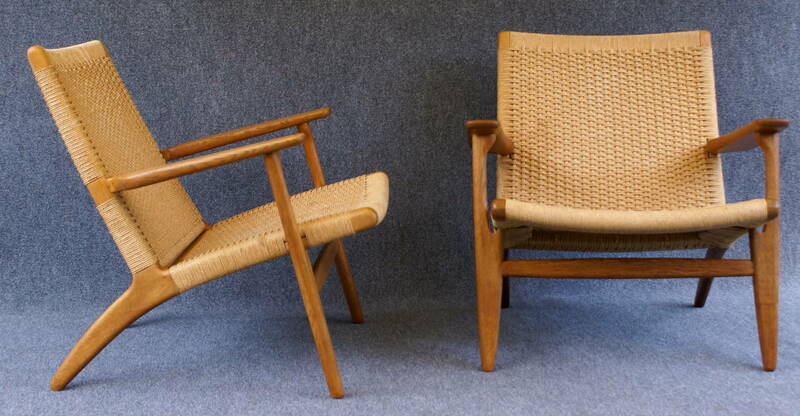 Here are some vintage sets (very expensive real Wegners and more affordable replica ones as well) along with some new chairs that give off a similar feel! P.S. Gigi New York is having a big summer sale and two colorways of the Gates Satchel are on mega sale- $475 marked down to $285! I had not- thanks for the tip!!! Love these chairs, especially in the first living room picture. Beautiful. Do you know where one would be able to find the coffee table that’s between the two white couches? Any interest in a coffee table round up? Thanks! I used to have these chairs! Okay, the armless import store knock off version. I should have kept them, they fold up to almost nothing and store well. Hi Erin. I, too, am obsessed with these chairs. Have you ever actually sat in one? Are they comfortable? Also, have you bought anything from France and Son? That price is relatively doable, but I have never heard of that company. I have been dreaming about a pair for our family room. Thanks so much for any thoughts! I have not. I assume they are comfy for chatting during a party, but not for like, reading a book or something. Draping a sheepskin over it would make it more comfy and look cool! Thanks to both of you! And awesome idea about the sheepskins! I love these chairs and have been looking for a chair for master bedroom. I am also wondering, is it comfortable to sit and read in, or does it just look good??? And does anyone know of any sources that sell the chair and a matching ottoman? Great post Erin!!!! I love the look of rope chairs but just can’t resist a soft, cushioned armchair! Two real ones in Kelly Klein’s Palm Beach house as well!! Those are my fave! I have a pair of these identical to #3 in my living room. They’re surprisingly comfortable, especially topped with a sheepskin and with my feet up on a little footstool. Think of a low slung beach chair and these sit really similar. Love the visual texture they bring to a space! Hi Erin, I love the warmth that they bring to the room, especially in a black/white/gray room, it’s the perfect amount of color and texture. Thanks for sharing! Emily Henderson recently used these in a Target collaboration for a blue and white sunroom. I loved them then…still love them! Wishing the scale was a little taller for my living area. Big man couch makes all pretty chairs look silly small. I cannot contain my excitement for rope chairs after reading this post. I’ll definitely be scouring my local markets in search of a similar chair for my home this weekend. I have been obsessed with them for the past year and want to get two….